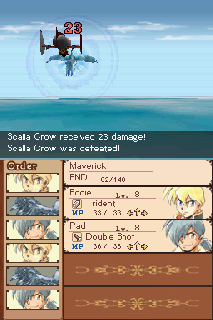 OverviewA DS RPG developed by Matrix Software and Red Entertainment. Lead Eddie on a quest around the world to find his missing father in a steampunk version of 19th century earth, complete with powerful airships that can carry you across the globe in mere hours. 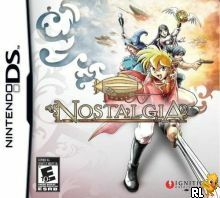 Nostalgia is a Ds RPG set in an alternate history during the late 19th century. It has a fairly basic plot following a young boy named Eddie and his companions as they seek out adventure to find Eddie's father and the secrets of an ancient civilization. The gameplay is fairly basic and offers little in the way of unique features, but despite that the combat can be quite rewarding and fun. You may not find gameplay that will blow you away. but you can at least expect to have a decent time playing the game. 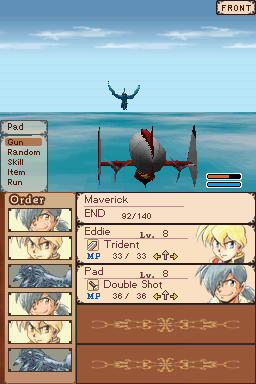 The graphics are pretty much as good as the Ds can do, nothing too special but nothing horribly horrendous either. 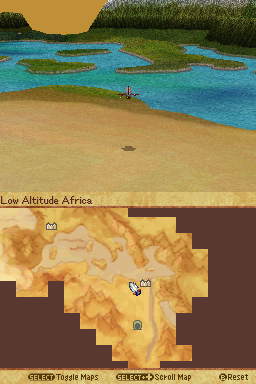 The art direction is nice, though it doesn't translate well to Ds graphics. The soundtrack is absolutely superb, really adding a lot to the game and giving the player everything they could want from it. All in all, it's a completely average RPG, you won't be getting any nostalgic feelings while remembering it one day, but you'll at least probably enjoy the experience once. This game was a huge letdown. From all of the trailers I've seen the game looked brilliant - from the makers of Final Fantasy, and a 3D RPG, I thought I was getting some amazing adventure, but I was wrong. 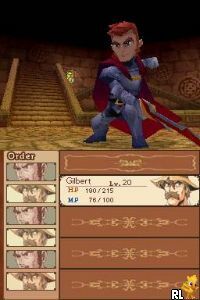 The game is a pretty simple, basic RPG with not a whole lot of added features to make it really "unique". The battle grades are interesting, and you earn SP points as well as EXP points. The SP points are a feature exclusive to Nostalgia. You start off with so many skills (kind of like magic) per person. Each skill starts at like level 1. To level up a skill, you use the SP points that you earn. At first it's confusing, but overtime you really get used to it. The storyline was okay, but quite unoriginal. There were too many things left untouched. They would begin to dig into an interesting topic, right when they would drop it again. Honestly I kept waiting, expecting the story to truly unfold and for the game to really start, but it never did. The battles are either WAAAAYYY too hard, or way too easy. 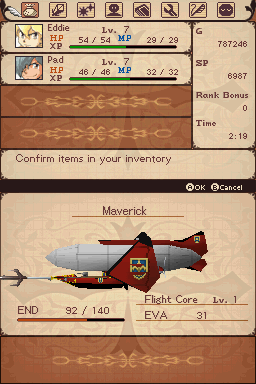 You battle in dungeons, as well as in the airship. This is also the type of game where your equipment won't last long, and you will constantly need to buy new items. The one thing I have to give this game would be its soundtrack. The music was all outstanding! I was very excited about the game at first because of this, for sometimes the music is an indication of the gameplay. Honestly, this game appeared to be put together way too cheaply and was a total waste of time. If you don't have anymore RPG's to try, then I suppose this one might be worth while, but there are far too many out there for this to be a first choice. After playing it once, I really wouldn't play it again. Setting in alternate Europe, the time when adventurers roam the world with their zeppelin airship. A famous adventurer was lost in his last adventure, leaving only a wreckage of his airship. The wreckage was salvaged and the news of his lost reached his family. Having heard that his father is lost, Eddie vowed to look for his father using the airship he left. Thus begins the adventure to the unknown, filled with Monsters, Ruins, Air Pirates, and Mysteries to solve. Now you can add videos, screenshots, or other images (cover scans, disc scans, etc.) for Nostalgia (US) to Emuparadise. Do it now! If you haven't noticed yet, we have a retro game of the day feature (top-right of the screen) wherein we feature a new retro title every single day! Now, you can vote for your favorite games and allow them to have their moment of glory. Click on the button below to nominate Nostalgia (US) for Retro Game of the Day.